Today we are celebrating Jazz's fourth birthday. I'm not sure where the years went, because it seems like she was a wee puppy just yesterday, but Jazz has spent her time on this earth wiggling her way deeper and deeper into my heart. Here's Jazz sampling her birthday cake. Now, I don't think I've ever baked a cake for my husband's birthday, but Betty Crocker would have been proud of this cake! It's made with natural peanut butter and carrots and has a cream cheese frosting. The "chocolate" icing was made with carob powder, so it's all safe for the dogs. Jazz got a chance to take a couple of licks on her own without the other dogs interrupting her birthday treat. After Jazz had a good taste, it was everybody's turn! Indy thought that this birthday business was seriously yummy and wants to know when he can have one of his own!! So, another wonderful year has gone by with Jazz. This year, she's earned two AKC agility titles, two USDAA agility titles, six CPE agility titles, the AKC Therapy Dog certificate, her AKC Companion Dog title, and, the one I'm most proud of, her DCA Road Dog title. Jazz is so much fun to work with and train, and I look forward to many more years together. Here's a few pictures of the dogs relaxing over the Thanksgiving holiday! Indy's big Thanksgiving accomplishment is that he's now able to get on the couch by himself! It's no longer a safe haven for the girls, and Indy has proven that he likes to be as comfortable as the next dog! Tess and Jazz snuggled together on the couch, which is rare. Tess seems to prefer to cuddle with people and not with other dogs, so it was a surprise when I caught her and Jazz snoozing together. Hope everyone had a wonderful Thanksgiving. The girls and I joined our friends Mariann, Jim, and Sammie for a walk in the park in the morning, and then we headed out to my sister's for a fantastic Thanksgiving meal and lots of good company. This evening, we're meeting up with friends for pizza and some agility practice. We are blessed with a loving family, good friends, and three wonderful Dalmatians. Who could ask for more? It was a great weekend at the CPE agility trial in Latrobe. 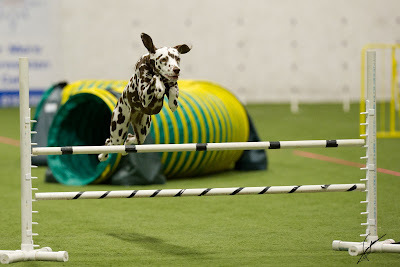 Two of our friends got their CPE Agility Trial Champion (C-ATCH) titles! On Saturday, Shaina finished her C-ATCH with a joint effort by her owner Lois and Lois' grandson CJ. Lois got the Jackpot run they needed and CJ finished the title with a very nice Standard run. Congratulations, Lois, CJ, and Shaina! On Sunday, we had another championship day when Mariann and our adopted Border Collie Sammie got their C-ATCH with a great Snooker run. Mariann has had many setbacks with her health, but her goal was always to get back to running Sammie, and she didn't let him down! On a smaller scale, Jazz finished her Level 4 Fun Games title this weekend. She's now in Level 5 in everything but Standard, where she's still working on the 8 required Level 4 legs. Tess also had a good weekend, coming within seconds of another perfect weekend. She was just a few seconds over time in the last run of the day, but all her other runs were qualifiers in the Championship level. Indy also had a good weekend. Here he is opening a puppy gift from Lois, George, CJ, Toby, and Shaina. They got him a wonderful BLUE fleece coat and a BLUE dog toy. At least now the boy has some things that aren't pink!! Indy was really good at the trial. He behaved well in the ex pen with the girls and did plenty of socializing with people and dogs. He got to see his sister Emily again when she and Barb stopped by on Sunday for some more socialization. Here's Indy and Tess napping in the ex pen. Congratulations again to Lois, CJ, and Shaina and Mariann and Sammie! We're proud of you all! My brother-in-law Jack had a knee replaced last week and has been in a rehab/nursing facility for therapy, so Indy and I went to visit him yesterday. This was actually Indy's second pet therapy visit, because he went to a local assisted living facility with his litter when he was just 5 weeks old! Indy was an instant hit with everyone yesterday. In fact, we were starting to wonder if we'd ever get to visit Jack, as we had to travel down a long hallway to get to his room and we were stopped every two feet by someone who wanted to visit with the puppy! Indy did a fabulous job. He was friendly with everyone he met and did well with the sights and sounds of a place like this. He visited the therapy department and took his first elevator ride. When we finally made it to my brother-in-law's room, he settled in nicely and played and then took a nap. Indy's favorite part of the visit was playing with Jack's socks! He loved the blue non-skid socks he was wearing, and Jack would wiggle his toes and Indy would play with his feet. Doesn't take much to entertain a puppy! I was thrilled with how well Indy did yesterday. I was a little apprehensive that he'd get mouthy with those puppy teeth, but he didn't do that at all. The folks there were so impressed with him and couldn't believe he was just 9-1/2 weeks old. So many people commented that they just wanted to take Indy home that we were telling them to take a number! I hope this was the beginning of a long pet therapy career for Indy. Tess and Jazz are both therapy dogs and it's such a rewarding experience to see how much joy they bring to people. I do much of my work at home, and as you might imagine, getting anything done with a puppy around can be tough! So that I could work on some transcripts, I set up a small pen in my office (along with the two dog beds already in there for the girls) and put a little bed in it for Indy. As you can see below, he thought that was a fabulous idea! It's amazing how many different positions puppies think are comfortable. In just a short time, Indy went from lying in the bed normally to lying with his head out of the bed to lying upside down in the bed and then lying upside down and half out of the bed with front feet straight in the air!! Indy is doing well and is fitting nicely into our family. He's doing a fantastic job at housebreaking and he's been a very good boy at night. The pet sitters came for the first time yesterday, and they are in love with him! Tess and Jazz continue to do very well with their puppy brother. In fact, Jazz is totally smitten with Indy and plays with him endlessly. Here's Tess and Indy soaking up some rays this past weekend. Jazz and Indy napping on the couch this morning. Not only has Indy bonded well with the girls, but there's been a fair amount of male bonding going on between Jim and Indy, too! Here they are sacked out on the couch after the agility trial on Sunday. I think Jim is just enjoying having another boy in the house! We're now even in the battle of the sexes...me, Tess, and Jazz and Jim, Indy, and Jim's parrott, Billy. Of course, we all know that girls rule and boys drool!!! Well, folks, I have a lot of explaining to do and I don't know quite where to start! Our friend Barb at Rim Rock Dalmatians bred a lovely litter of Dalmatian puppies whose Daddy is one of only 8 Dalmatians in the world who have two copies of the gene for low uric acid (LUA). Every puppy he produces will have at least one copy of the gene and therefore also have low uric acid. 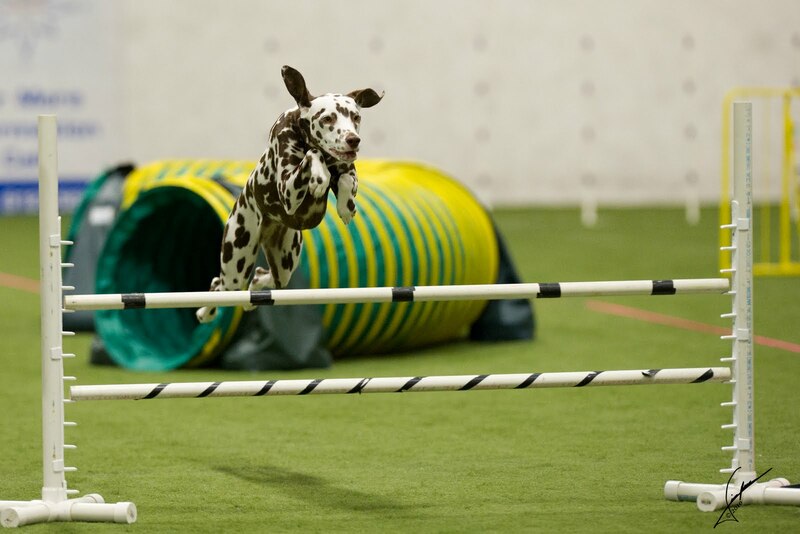 We have always been impressed with Barb's efforts to improve the health of the Dalmatian breed, even though it is not always popular with many long-time breeders. As if that weren't enough, the puppies were also lucky to have Bizzi for their mother! She's got an International Championship, and both AKC and UKC Championships and Grand Championships, but most importantly to us, she is a wonderful, sweet girl. Check out the puppies' blog at http://www.maks-bizzi.blogspot.com/. Let me first say that Jim and I did NOT plan on taking a puppy from this litter. Although a third dog was probably in our future, we were planning on it in perhaps another two or three years. As you can see below, all our planning went out the window on Friday evening when we picked up the sweetest little boy puppy!! There were several circumstances that led up to this, but since he really wasn't planned for, we named the puppy Rim Rock's Out of the Blue! His call name is Indigo, but we mostly call him "Indy." Our blog friend Kim has a wonderful Dal named Indy, so we already knew it was a special name. So although the timing wasn't quite what we had planned on, Indy became a part of our family Friday evening and has spent the weekend wiggling his way into our hearts. He's sweet, funny, smart, and cute as can be! Like all puppies, he's an angel....when he's sleeping! Who could resist this little guy? He jumps into the pile of dog toys and pulls out the biggest stuffed critter he can find and shakes and tosses it. Here he is napping on a toy duck! Here's Indy with Tess and Jazz at his very first agility trial. He was awesome! He was very comfortable in the building with all the noises and sounds of an agility trial, and he was incredibly well behaved in the ex pen with the girls. Indy's sister Emily joined him for some socialization at the trial today. She also did very well in the trial environment and became more and more comfortable while she was there. Here they are snuggled in the ex pen together. By the way, Indy wants me to let you all know that he's terribly embarrassed that all his hand-me-downs are pink!!! He's the first boy puppy we've ever had and he has to suffer through some pink beds and blankets before he can get some decidedly more masculine accessories! Tess and Jazz have done phenomenally well with Indy, and I think they're going to love having a little brother. His temperament is fantastic. He's the right mix of loving, curious, smart, and eager to please. Even if the timing wasn't quite perfect, he was just too good to pass up! We have known Barb since 1988 when we got our first Dalmatian, and she played a big part in us getting three of the four we've owned, so it's a real privilege for us to welcome a Rim Rock Dalmatian into our home. Thanks, Barb, for trusting us with this special little boy. We look forward to many years of adventures with him!! Just returned from CPE agility at K9 Four Seasons Athlete Center in Washingtonville, OH, where Tess earned another Perfect Weekend ribbon. Tess qualified in all eight of her runs on Saturday and Sunday, as well as two qualifying runs on Friday evening that didn't count towards the Perfect Weekend calculation. All of Tess' runs were in the Championship level, which is the highest level of competition in CPE, and all runs must be clean. Jazz was just one tiny mistake away from a perfect weekend herself! She qualified in seven out of eight runs in Level 4 and Level 5, just one error away from earning her first perfect weekend. Jazz is improving by leaps and bounds (pun intended) with each trial. She finished her Level 4 Strategy Games title and had qualifying scores in all her Level 5 runs. Her only NQ of the weekend was a back-jump in Level 4 Standard, and I think it was because she got excited when she saw the broad jump because we've been working it in our obedience training. Even though she was heading in the wrong direction, she thought she'd show off her broad jump skills ;) Very few judges put the broad jump in their courses, so it's not something Jazz has encountered often in agility and it just appeared at a time when we've been practicting the broad jump exercise in preparation for Open Obedience competition. All in all, we enjoyed a very successful weekend at CPE agility, as well as a great weekend with friends. We're looking forward to another trial in two weeks at B&D Creekside Activity Center in Latrobe. My Front & Finish magazine arrived today and it contains the 2010 Bratix Agility Ratings, so, of course, I perused the Dalmatian rankings to see if there was anyone I knew. Imagine my surprise when I saw that Jazz was ranked No. 6 in Novice!! Also in Novice, our friend Susan's liver boy Ripley was No. 8, and in Excellent A, our blog friend Kim's Peyton came in at an impressive No. 3! !